Photograph 2006 and text 2018 by Jacqueline Banerjee. 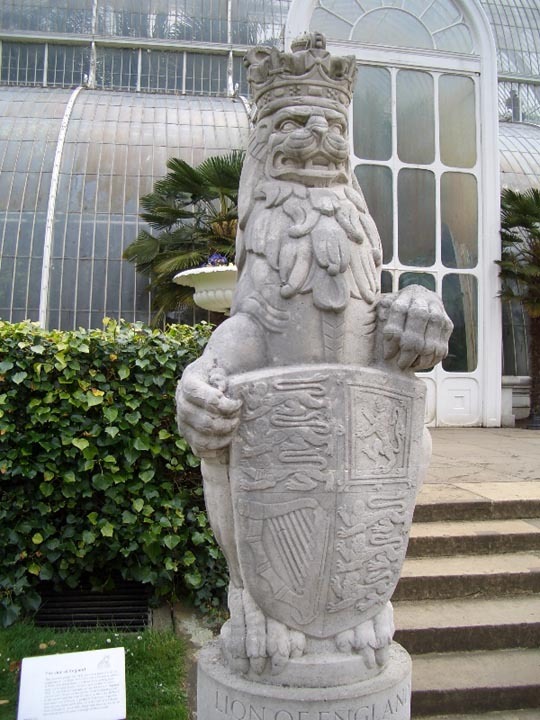 Also explained on the plaque is the significance of each quarter: "In the first and last quarters are the lions of England; the lion and tessure (a double frame) of Scotland appear in the second and the harp of Ireland in the third. Richard Lion-Heart, son of Henry II, probably first chose 3 golden lions set one above each other on a red field as the Royal Arms of England. Since then, these lions have appeared on the coat of arms of every sovereign of this country." The "Beasts" were originally modelled in plaster to decorate the route to Westminster Abbey for Queeen Elizabeth II's coronation in 1953. They were much admired, and Woodford was later commissioned to produce them in Portland stone. They enhance the Palm House and look very grand in this location. "James Arthur Woodford, RA, OBE." Mapping the Practice and Profession of Sculpture in Britain and Ireland 1851-1951, University of Glasgow History of Art and HATII, online database 2011. Web. 3 May 2018.